There's no denying that the HTC One X was an amazingly solid smartphone. On the surface it even looked like as good a package as its main rival at the time, the Galaxy S III, and having a head-start to the market it was almost expected for it to become a huge success. The devil turned out to be in the details though, and the One X never quite managed to get the same traction as its Samsung rival. There must have been so many if onlys around the HTC HQ for missing an opportunity like that, that the company didn’t even wait for the successor to come and fix the issues, but released a refreshed model. 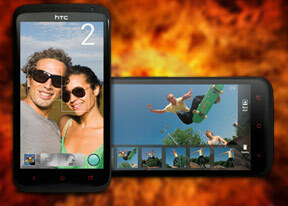 Enter the HTC One X+. It's faster than its predecessor, offers more storage and an ampler battery – quite nice upgrades. True, they don’t make too dramatic a difference, but as we said – the starting package was pretty great already and it's just the details that needed polishing. Despite taking a few punches in this year's flagship wars, HTC isn't ready to throw in the towel just yet. With the holiday shopping season just around the corner, the updated One X+ comes at the perfect time to turn things around. And while the One X+ is certainly better prepared, the challenge has also become harder. During the One X facelift, a new contender emerged in the face of the LG Optimus G and its quad-core Krait CPU. The LG flagship smartphone is certainly the most powerful currently on the market, but the One X+ is the more mature device and has Jelly Bean on its side. Grab the popcorn – this one is going to be a thriller.